A person’s vertical jump is one of the best indicators of athleticism. It is no wonder the NFL Combine and NBA drafts place great emphasis on the measurement. In Basketball, the benefits are obvious. A powerful vertical jump will help you score points and excel in defence. Here are 5 exercises that are commonly used to increase your vertical jump. I would personally recommend trying these for a few weeks, making sure to keep track of your progress by using the measurement methods described in a previous post. Consider moving onto a more comprehensive vertical jump training program if you want to maximize your results, like I did. In order to jump well a person must have leg strength. Leg strength produces power which is ultimately used to help a person to jump high. The squat is the ultimate leg workout, which primarily targets your quads and glutes – 2 muscles which are heavily involved in your leap. We’re going to discuss the three core variations of the exercise you should be doing. 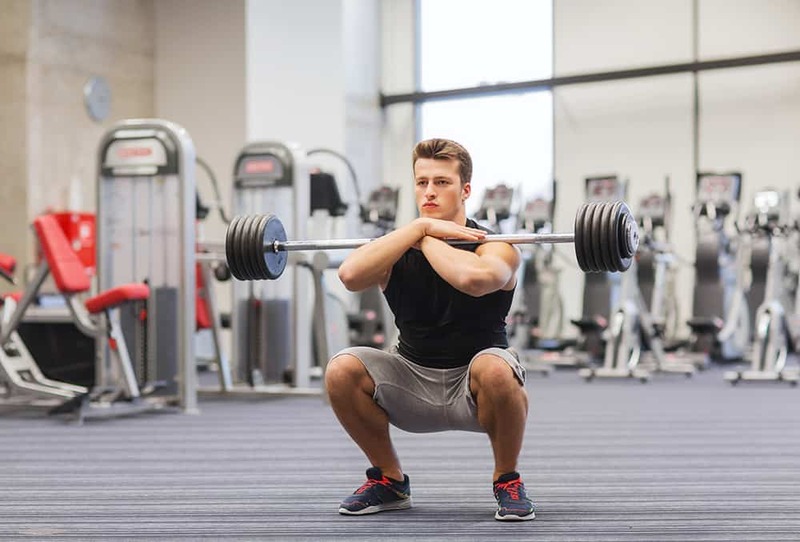 Hopefully, you already know how to perform a basic squat. Since you’re training for your jump, it’s actually better to be be performing high rep, high intensity bodyweight squats. Since you’re not using any weights, it’s normally best to put your arms out (shown below) or put your hands behind your head. You should aim for a hundred squats, and move on from there. Keep arms stretched in front of you, or behind your head. Ensure hips and back are straight and face directly forward. Keep you arms to your side, bent at the elbows. Jump into the air and tuck your legs in to maximize muscle activity. This variation of the squat is particularly useful if you don’t have weights but want to push your leg muscles harder than the classic squat. It requires you to stand on one leg and to squat down on the ground and then back to the starting position. You should balance yourself with your opposite hand against a wall. This exercise is performed by standing at least 12-inches away from a wall. Place your feet about shoulder length apart. You will then place your hands onto the wall to keep your balance. At this point you will slowly raise and then lower your heels from off the ground. If you are performing this exercise correctly you will feel a tightening sensation in your calf muscles after you start to perform the reps.
Calf presses can also be performed to improve calf strength. This type of exercise is typically done with a machine at a gym. The calf press will require a person to lie back on the machine and place their feet onto the press plate. Then they will press upward on the plate to perform a rep.
A calf raise can also be performed on a machine designed for this purpose or on a weight bench that has this feature. The calf raise requires a person to sit on a bench and to place the top part of their legs (at the point where their ankle meets their feet) underneath the lifting apparatus. Once the legs are into position a person will then extend them outward to perform a rep. Jumping rope is a great way for people to develop their leap and will also boost explosiveness and speed. Make sure you keep your feet together as you twirl the rope – don’t skip as you jump rope. As a variation, you can alternate legs as you perform the exercise. Believe it or not running up a set of stairs will help to improve your ability to jump really well. When you run up a set of steps you are building up core muscles that are needed for jumping. The trick to making this exercise work for your jumping routine is to make sure that you are maximizing your runs and really trying to push yourself through the process. Box jumps are one of the most effective exercises to increase your leap. It is important that the box can support our weight and keep you balanced. To maximize the effectiveness of the exercise, the box should be as high as you can jump safely and land with both feet in a half squat pose. You can also perform a lateral box routine by jumping side by side over the box. Plyometrics exercises are designed to exert maximal force on muscles in a short amount of time. These routines require people to extend and retract their muscles in a very rapid motion. This type of exercise builds up the body and it increases the power in a person’s body. Truck jumps which requires a person to stand with their feet spread shoulder length apart before jumping into the air. When you jump into the air tuck your legs in (knees to shoulders) and then extend them back to the ground so you can land properly. You should tuck your legs in as far as they can go. Power Skipping is plyometric exercise that requires you to lift your upper leg up as high as possible while you skip. The burpee is designed for you to start in a standing position and then to go down to the ground. Once you are on the ground you should push up and finish with a truck jump. This particular exercise requires a lot of extending and retracting of muscles. These are some of the many different types of exercises that will help you to improve your leg strength and to reach your vertical jumping potential. While exercises like squats and calf raises are easy to execute and great for building strength, if you aren’t doing the more complex plyometrics, you are literally killing your vertical jump. If you are looking for a more dramatic increase in your vertical, I would highly recommend one of my recommended training programs which cover these, and more, in much greater depth.